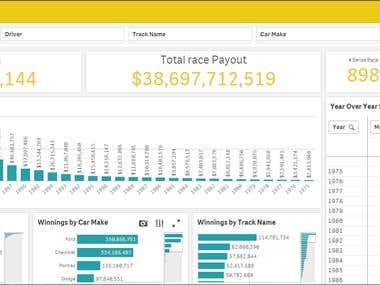 Give me your data and I will give you a QlikSense and qlikview app to bring insights to life in interactive visualizations capable of drill-down investigation.  I have developed solutions and Proof of Concepts for a number of clients.  2+ years of experience in Qlikview and Qliksense. - Delivered advanced/complex reporting solutions such as Dashboards and Standardized reporting using Qliksense. - Delivered Qliksense Mashup web Applications. -Delivered production applications(Sales ,Finance Applications).